After waiting for the (delayed) results, I’ve finally received word that my work was accepted into the upcoming Art Melt at the Louisiana State Museum in Baton Rouge, LA. My painting “Trophy” (from my “In Our Veins” series) was selected. The jurors for this year’s competition were Rachel Wolff (Brooklyn-based critic, writer, and editor); Benjamin Hickey (Curator, Masur Museum of Art, Monroe, LA); and Kelli Scott Kelley (Artist and Associate Professor of Painting, Louisiana State University, Baton Rouge, LA). There will be a Preview Party on July 14th from 6:30-10pm in which there will be an open bar, food prepared by Heirloom Cuisine throughout the entire evening, and live performances by the band King James and the Special Men and Of Moving Colors dance troupe. Tickets are available through www.ArtMelt.org. The opening reception will be July 16th from 5-10pm and is open to the public. The exhibit will be up through August 28th. 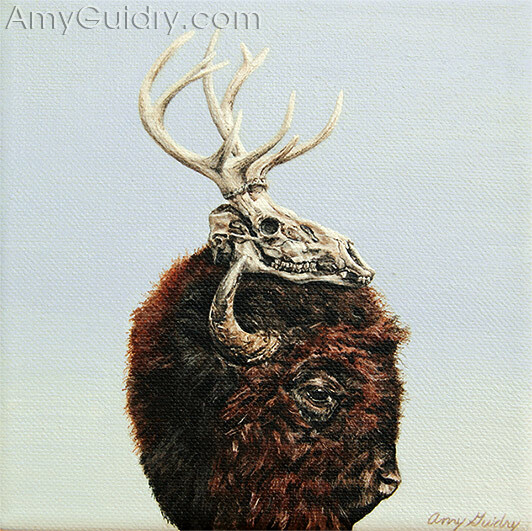 For a close-up view of “Trophy” as well as my other paintings, visit my website at this direct link: www.amyguidry.com/trophy.html. 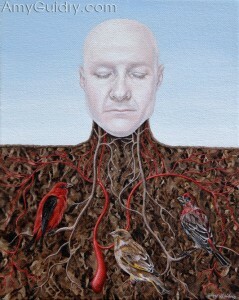 At last, I have finally finished another painting from the “In Our Veins” series. I’m always looking for ways to improve, no matter how big or small, so I really focused on the textures in this piece. Though you can’t really tell here, so be sure to go to my website for a better look, in addition to a zoom-in feature (the magnifying glass icon on the top right)- www.AmyGuidry.com/sequence.html. The title is “Sequence” and it is an acrylic on canvas, 6″ wide by 12″ high. Much of this series, as stated in my artist statement (which is posted on my website), deals with the life cycle so the title is in reference to that process. Both life and death are represented, new life- plants, animals- are seen building upon each other, one leading to the next, which is also why I opted for a long, vertical composition. The animals I chose follow, for the most part, a hierarchy of sorts as seen in nature. Though it may be odd for a vegan to discuss this, but the animals depicted follow each other in the food chain (side note- as a vegan, I realize this is a fact of life, however I have a choice when it comes to what I eat). The roses were an almost subconscious choice at first, but seemed appropriate for the piece given that we use roses to celebrate life as well as to honor those that have passed. I have another exhibition coming up next month, which is actually only a few weeks away. 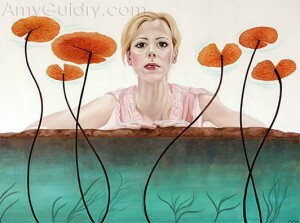 I will have work in the “Rivers” group exhibition at Wally Workman Gallery in Austin, Texas opening July 9th, 2011. The theme is open to interpretation, so it won’t be all water scenes and landscapes. 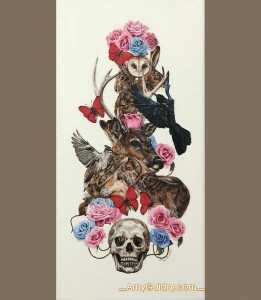 My painting “Synergy” will be in the show, in addition to other works I have in the salon area of the gallery. “Synergy” is an acrylic on canvas, 8″ wide by 11″ high. I picked this piece for the exhibit given that rivers nurture life. The roots and veins in the painting bring life to everything above and below the ground via rivers of blood or rivers of water. All of these elements working together, nurturing each other, nurturing life. You can view a larger image (with a zoom-in feature, as well) at www.AmyGuidry.com/synergy.html. The exhibit officially opens July 9th, with a reception from 6-8pm. 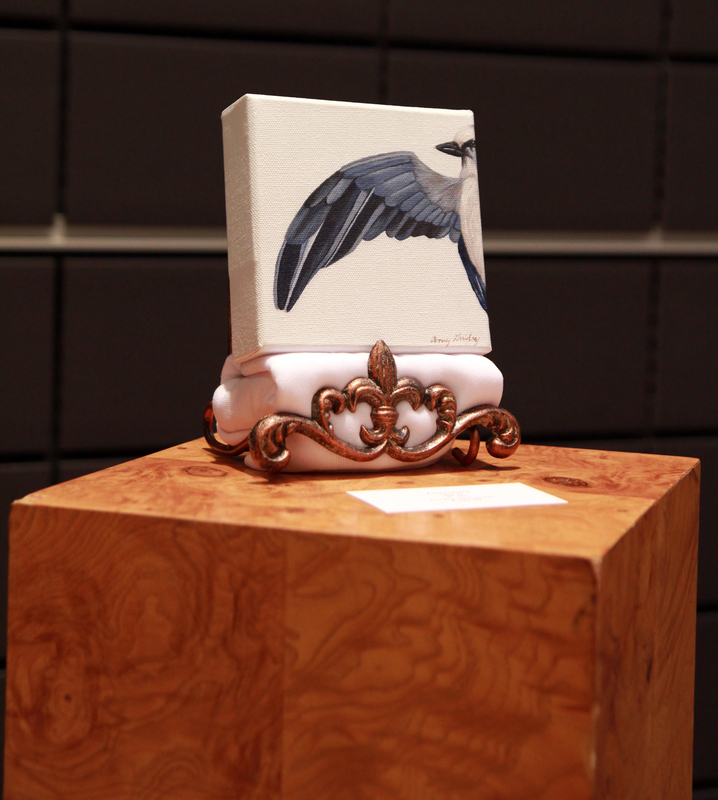 However, there will be a preview of the show coinciding with First Thursday Artwalk on July 7th from 6-8pm. And one more reminder: June 26th is the opening for 54th Chautauqua Annual Exhibition of Contemporary Art at the VACI in Chautauqua, NY in which I was one of the 25 selected artists. The reception is from 3-5pm with a talk by juror Jim Kempner of Jim Kempner Fine Art, NYC. 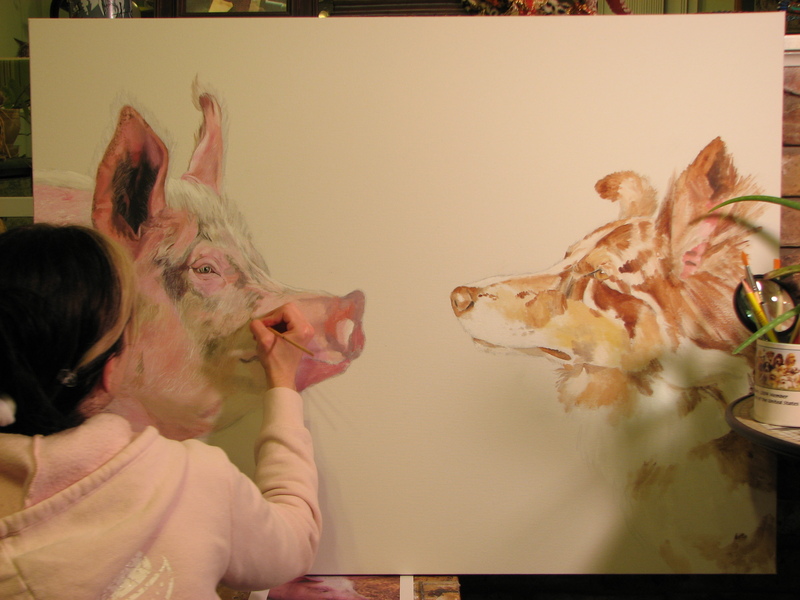 Clearly an old pic from when I dyed my hair dark- working on "Food or Pet?" One of the more popular questions I’ve been answering in interviews as of late (in one form or another) is “why do you create art?” Which I’ve always felt it would be easier to ask me why I breathe… so I would end up giving a response that would in so many words say it is innate. Which is true, of course, but not the in-depth answer they’re looking for. So I’ve been considering this question and have come up with an answer (or at least a good metaphor). When I am looking to create, I think the process is much like that of an archaeologist, or an inventor, or a scientist looking to make the next medical breakthrough. Since I’ve seen enough National Geographic and Jurassic Park to have a better understanding of archaeology, I’m going to use that as my basis. So I’m basically going on a dig- in search of ideas which are hidden well within my mind. When I come up with an idea or a concept, I rush to quickly get it down on paper- it’s like making a new discovery. Though sometimes I don’t always find what I set out to look for- it may be something else, but just as exciting. Once I hit something, I keep digging to reveal more (in my case, rapidly sketching everything before I forget). Once I’ve exhausted that area, I continue my search elsewhere to find any missing pieces or something entirely new, going in any and all directions. One idea leading to another, or maybe a slight variation of an idea, upon another variation and another, so on and so forth- the possibilities are endless. Once I’ve made this discovery, I want to share it with the world. But it has to be presented properly (presentation is everything- they weren’t kidding)). An archaeologist wouldn’t just reveal a dirty pile of bones- they have to be cleaned, refined, and put back together. So my work has to be “cleaned” and refined as well, put together to make a whole. It takes time, effort, technique, attention to detail, and maybe even trial and error. It has to be pristine and professionally presented for the proper unveiling. Going back to my original answer, it is innate, and as basic as it is, that may be the best explanation. However, maybe this comparison and the explanation of the creative process (at least for me) serves as a good answer in itself. The excitement of a new discovery- who wouldn’t find that addicting? To view more of my work, including the (remaining) available “New Realm” 5″ x 5″ paintings, visit my website at www.AmyGuidry.com. I did an interview for Meaning-full recently and it is currently posted online! For those of you that don’t know me personally, this interview gives a little more insight into my work, my process, as well as a little more about me. And there are lots of images, so be sure to check out the second page of the post in order to read the interview. 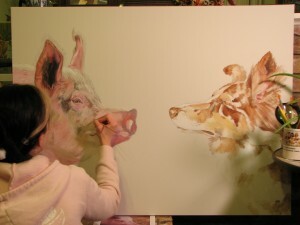 Just go to http://meaning-full.com/05/meaning-full/painting-amy-guidry/. There’s also a link to my site from the interview, but in case you don’t know, my work can be found at www.AmyGuidry.com.